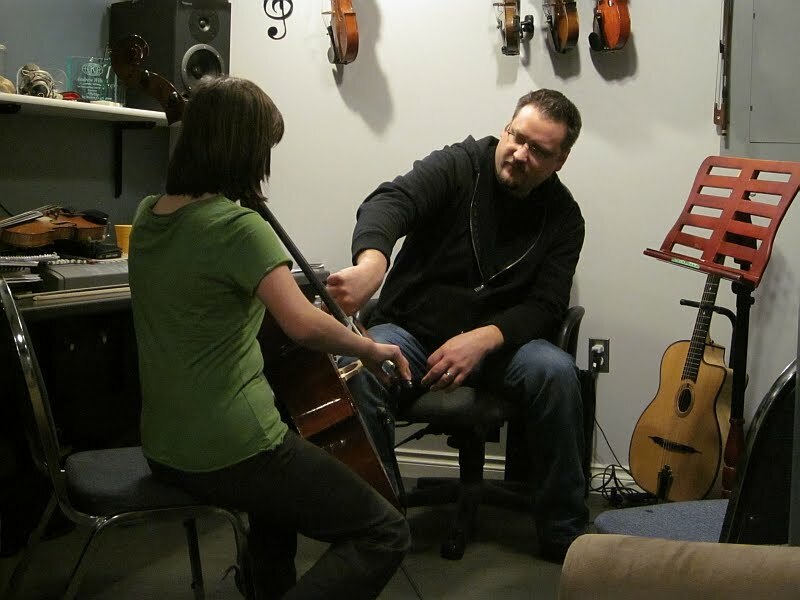 Almost three years ago, Younger Daughter started taking fiddle lessons from a remarkable teacher named Andrew Wilson. He and his wife met as traveling musicians and they now have four (homeschooled) kids who are nearly as talented as their parents. During the summers, they often hit the road as a family and make music around the country. Last summer, Andrew won eighth place in a national fiddle competition. It has, to put it lightly, been a privilege to have him teach Younger Daughter. So imagine our dismay a couple weeks ago when Andrew told us he would be touring with his family again this upcoming summer... and not coming back. Yes, the entire family is hitting the road for a whole year, touring musically. Sadly, at the end of that year they'll be looking to settle permanently elsewhere, possibly Texas, where fiddle music enjoys a more popular footing and he can draw from a larger base of students. He plans to keep about one-third of his "favorite" students (his word, not mine) and teach via Skype. Younger Daughter is among that group. 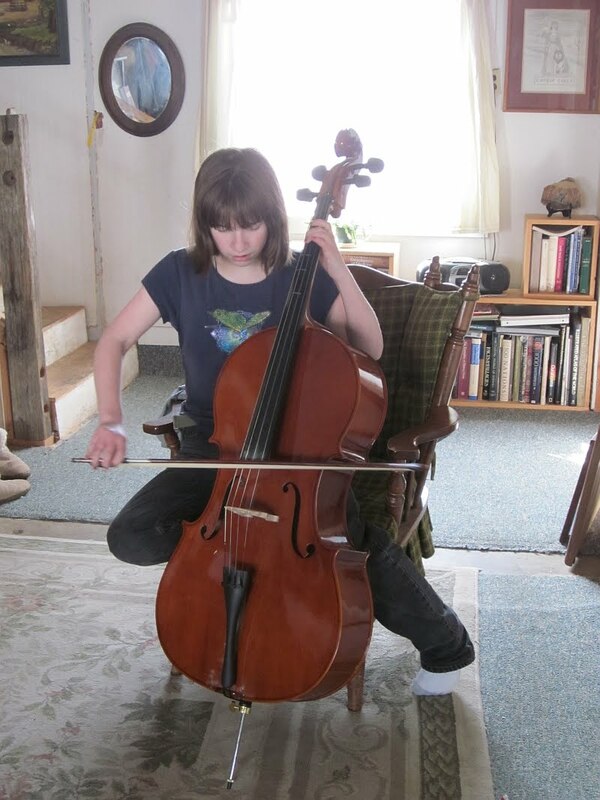 Meanwhile, Younger Daughter has been enjoying a new instrument: the cello. If you remember, Andrew loaned her his own personal instrument to try out. “I wouldn’t give it to anyone,” he told her, “but I know you’ll take good care of it.” She has treated that cello like the finest china, knowing the trust that is placed with her. She has also fallen absolutely in love with it. Her progress has been nothing short of astounding. So imagine my shock last week when Younger Daughter's lesson was over and he asked to speak to me privately for a moment. He told me since his family had to pare down their possessions in order to fit all six people into the RV when they hit the road, he won't be taking the cello. "I want to give it to Younger Daughter," he told me. My jaw hit the floor. And I mean, hit the floor. Gifting her with his own personal instrument? "But your wife gave you that cello for Christmas," I sputtered. "We talked it over. She's in total agreement," he told me. 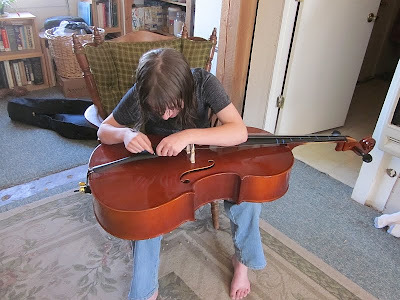 I sputtered some more, but he said if Younger Daughter doesn't take the cello, it will either go into storage (which doesn't do stringed instruments any good) or will go into the loaner program. Neither option is a fate he wishes on this instrument. He'd rather it go to someone who will get enjoyment from it. I went home in a state of shock and discussed the matter with Don. Together we decided to accept the gift with the graciousness with which it was offered. Then it was Younger Daughter's turn for her jaw to hit the floor. After a day or two of almost shying away from the cello -- purely because she couldn't believe her good luck -- Younger Daughter has been playing it five or six times a day. She's not practicing classical cello pieces; rather, she's exploring Celtic music (her favorite genre) and using the cello for alternate purposes. Andrew couldn't be happier that his gift is being so well used. He told me today that he's been on the lookout for a student he felt was worthy of gifting his cello. Younger Daughter is humbled and honored to be the one so chosen. We are going to miss Andrew and his delightful wife terribly, and can only wish them the very best on their year of adventure and wherever they chose to settle in the future. This brought tears to my eyes - what a lovely, generous gift. Sounds like a true treasure and something that gave them as much delight to present to your daughter & family as it is for her to receive it. Wishing her many happy days of playing it! What a gift!! This is beyond a gift! And it's really exciting to know she'll also get to 'keep' her teacher. This is the kind of blessing that helps shape a life....forever. God bless this good man and your sweet baby girl! I was just logging off for the night and since RR is my homepage I scrolled down before closing the window, and I'm sure glad I did. What a nice thing to go to bed thinking about. Life is sweet. People are good. With a steady business of students, I'm sure another good teacher will be attracted to the area. Hope the Skype thing works out in the meantime. What a glorious gift. It says a lot about your daughter and family that he would trust her with it. Maybe someday you could post audio of her playing it. Andrew is an artist and sees that in Younger Daughter. She was not only given a gift, but is according to Andrew, gifted. I'm certain that she'll share - and pay it forward. Waaaaay back while at the university, I took a class which required students to attend recitals of various musical instruments. At least a month ahead, I noted the upcoming cello recital and the dread began. I didn't want to attend a CELLO recital, were you kidding me? I KNEW it would be a total waste of the afternoon! The day arrived and I dressed "appropriately" for the instructor's eye. Degrudging every step all the way across campus to the concert hall, imagine my surprise to learn I was a week early! I was going to be privileged enough to go through all the same feelings AGAIN a week later! The day arrived and I was ALL attituded up. Imagine my total and complete surprise to find myself enjoying the concert! I was enthralled by the sound coming out of that instrument! My anticipation nearly pulled out every note! TEARS streamed down my cheeks as I personalized every tale the cello shared in its myriad of languages. IT WAS EYE OPENING and the best concert I've ever attended. Congrats to younger daughter for her diligence to master a difficult but amazing instrument. I'll be interested in updates on younger daughter as well as Andrew and his talented (and generous) family. What a beautiful, generous gift. Maybe you could put a short video of your daughter playing it. I would love to hear it. I love the sound of the cello. Beautiful. I know the feeling from the other side. I once gave an unneeded violin to a deserving beginning student. Giving blesses both the giver and receiver. Now that is a true gift from the heart! May your daughter enjoy many years of beautiful music. Perhaps someday, she will be able to 'pass it forward' to another. There are so many good people in the world; thank you for sharing this special moment with us! Thank you for sharing Andrew's generosity with all of us; his gift brought tears to my eyes. Absolutely delightful gift, nay a treasure. May lucky daughter enjoy it all her days. Could YD be persuaded to post video of her Celtic-influenced cello playing? What a great gift and special gift to receive. What a sweet story - I love hearing of those blessed exchanges. Something given freely, accepted humbly. I would love to know if Andrew and family settle in Texas. If he's within an hours drive, we'd like him to our kids instructor! Wow, that is so great! Someday, I hope hear her play that beautiful instrument on the radio or some other form of published music. What a wonderful gift for your daughter. Our neighbor has indefinitely "lent" my son their 87 year old violin for the same reason, to keep it in good condition and to be played, and we are honored to be able to do so. We also understand the emotions of you losing a teacher this year. Our 74 year old violin teacher, after 6 years, has decided to pass our children on to another teacher (of her choosing) who she believes can take our children further than she can. We love her and will miss her tremendously. We are so blessed with people in our lives with such integrity.